Donât Just Mask Pain, Relieve, It in Minutes. 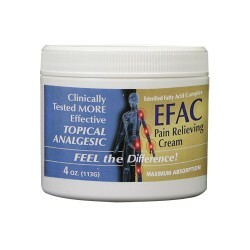 The esterified oils in EFAC Pain Cream provided both short-term relief and long-term benefits. It is a combination of clinically proven esterified oils and menthol. 95% of the esterified oils absorb through the skin to reach sore muscles and joints while menthol adds surface cooling for pain relief. Esterified Fatty Acid Complex (EFAC) is a major medical advancement that was awarded a U.S. patent for its unprecedented properties.